The Anglers Return is featured in Monty Halls book! 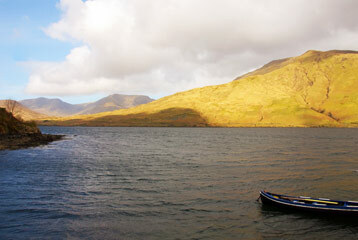 Connemara is a paradise for many outdoor activities from fishing and cycling to beaches and boat tours, you can walk, hike, bike, paint, read, bird watch, golf and more… We have summarized below many of the options available to you while you stay at the Anglers Return and explore the West of Ireland. 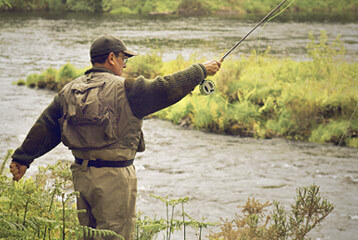 Connemara is home to world-class brown trout and salmon fisheries, and a stay at the Anglers Return situates you perfectly to take advantage of them all. 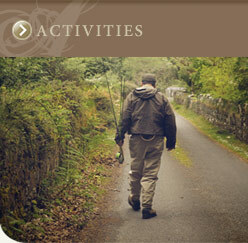 Whether you seek wild, native brown trout, ocean-run sea trout, or the noble Atlantic salmon, Connemara is the ideal destination – and the Anglers Return the perfect headquarters to launch the fishing adventure of a lifetime. There are many things to do while you stay at The Anglers Return. From fishing and cycling to beaches and boat tours, you can walk, hike, bike, paint, read, bird watch, golf and more. 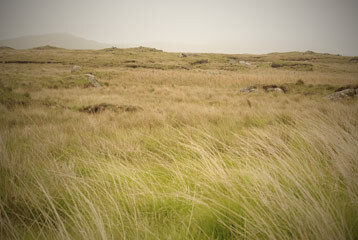 Connemara is a walkers paradise, with remote beaches, bogs, forests and mountains all within a short drive away from the house. We especially recommend a trek through the famous Roundstone Bog, directly across the river from us; where you will encounter purple moor grass, bog myrtle, rare heathers, orchids, a variety of lichens and mosses and perhaps a merlin or an otter or two!" 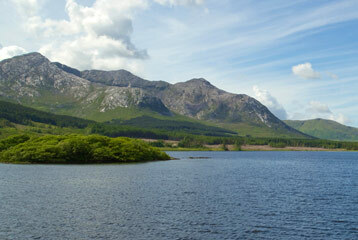 The Twelve Bens and Maamturk mountains lie a short drive to the North East, with Derradda Hill and the Ballynahinch woods only a short walk away. In addition, the headlands and sand dunes along the coast provide miles of spectacular seaside walks for the non-climbers. We have a large selection of maps and walking books, and for serious hikers, we recommend a visit to the Connemara Walking Centre in Clifden where you can buy booklets on the local trails and sign up for a guided walking tour. 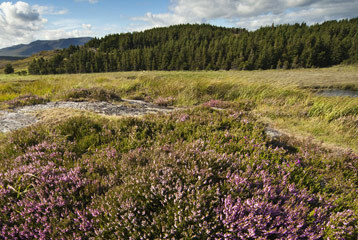 At the day’s end, we provide drying facilities for your boots and gear – along with a hot fire and a cup of herbal tea. Paul Phelan of Walk Connemara. Riding a bicycle is a relaxing way to tour the villages, beaches and byways of Connemara. Bicycles are available for hire in Roundstone, Clifden and Galway City. Few people realize that Connemara boasts one of the finest golf courses in Ireland, and it's only a 20-minute drive from the lodge. The Connemara Championship Golf Links is a classic 27-hole championship links course stretching between the land and sea. 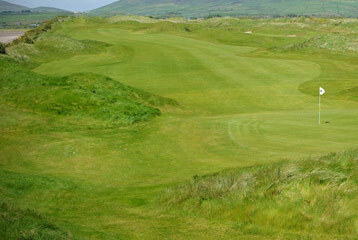 Designed in the 1970's by Eddie Hackett, the Connemara course will challenge the most discriminating golfer. Clubs, carts and buggies are for hire on premise. 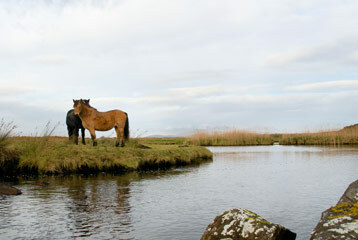 Wandering wild in the open fields and beaches are Connemara ponies, whose ancestry is said to include stallions that swam ashore from wrecked Spanish Armada galleons. The Cleggan Beach Riding Centre just north of Clifden offers both beach and mountain treks for a few hours or a day's duration. A few kilometers south of Clifden you'll find the Errislannan Manor Connemara pony stud and riding centre, home of the Connemara Branch of the Irish Pony Club, where ponies are for hire Monday through Friday of each week. Nearby Gorteen Beach and Dogs Bay are two of Connemara's finest white sand beaches, formed from the tiny shells of sea-dwelling Foraminifera, not rock as is the case with most beaches. With beautiful, rugged surroundings, they offer unsurpassed walking, beachcombing and bathing opportunities. Windsurfing is very popular on Gorteen Beach. The "Island of Discovery" departs daily to the beautiful island of Inishbofin from Cleggan, a scenic fishing village located a few kilometers north of Clifden. 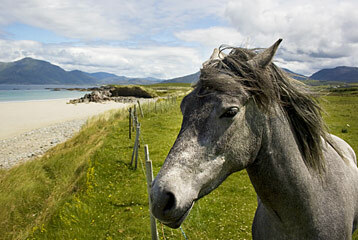 The 30 minute ride takes you along the rugged coast of west Connemara and almost 10 kilometers across the open sea. Inishbofin is renown for magnificent scenery, historical and archeological features, cliff walks and deserted sandy beaches. Daily ferries depart from Rosavell, an hour's drive to our east, for the world-famous Aran Islands. With breathtaking scenery, prehistoric stone forts, early Christian ruins, medieval castles, towering cliffs and sandy beaches, the Arans provide a rare glimpse into history and a traditional way of life. You can tour the main island, Inis Mor, by bicycle, mini-bus – or traditional pony and trap – all of which are available for hire at the ferry dock. The "Corrib Queen" departs from Oughterard pier daily to cruise beautiful Loch Corrib, with a luncheon stop at Ashford Castle -- a short 1-kilometer walk to the village of Cong, famous as the location of John Ford's 1951 classic Hollywood movie "The Quiet Man". After lunch, the cruise continues to Inchagoill Island for a guided tour at St. Patrick's monastic site, which dates back to the 5th century, before returning Oughterard in time for tea. 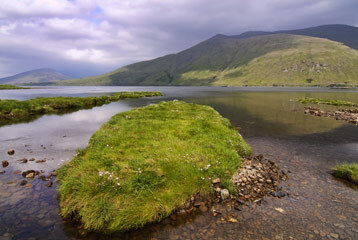 A scenic 30-minute drive north from The Anglers Return takes you to Leenane, the departure port for "The Connemara Lady" on cruises down the incomparable Killary Fjord. The 150-passenger cruise ship is fully enclosed, with a galley serving hot meals, a full bar, and multiple observation decks. Trips can be arranged with an experienced local skipper to the small islands off the coast, including Slyne Head and a large seal colony. Prior booking is necessary to secure this trip. Weather dependent.